Heatec hot oil heaters (thermal fluid heaters) for the hot mix asphalt (HMA) industry are designed around a helical coil. Our coil meets ASME code. Although we make several other types of thermal fluid heaters for other industries, our helical coil heaters are the most popular hot oil heater in the HMA industry. Their popularity comes from their simplicity, efficiency, low maintenance and relatively low cost. Nine standard models are available. Rated thermal outputs range from 0.7 to 4 million Btu per hour. All can be customized to meet your specific needs. 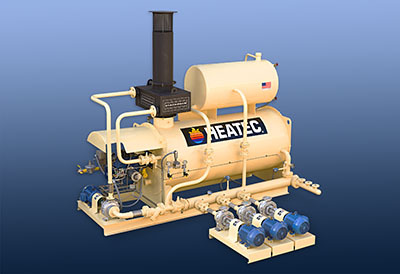 Heatec hot oil heaters are available in two basic configurations: HC and HCS. The HC configuration (shown above) has a manifold that enables the heater to operate with multiple thermal fluid circuits. However, the HCS heater can be upgraded to the HC configuration by adding an optional manifold. The upgrade can be done at any time as needed. Helical coils in our heaters set us apart from others that produce helical coil heaters for the HMA industry. We are the only heater manufacturer that builds all coils to ASME code. Certification is optional. Coils in HCS heaters have a three year warranty. Coils in HC heaters have a five year warranty.